Marine Le Pen told RTL Radio that the government's plan to fight against French jihadists was "cosmetic" and will remain ineffective as long as border controls are not restored within the European Union. Others are wondering who will control the data collected by the new website and hotline, and how the information will be used, especially when it involves young people who have not been convicted of a crime. The French government has unveiled a new plan aimed at preventing French citizens or residents from waging jihad in Syria and other conflict zones in the Muslim world. More than 700 French nationals and residents are now believed to be fighting in different parts of the Middle East and North Africa, including at least 500 in Syria alone, according to French intelligence estimates. Senior French officials have voiced increasing concern over the potential threat that these radicalized "enemies within" will pose when they return to France. The government has also faced criticism for failing to take steps to prevent its nationals from traveling to Syria in the first place. Interior Minister Bernard Cazeneuve presented the multi-pronged anti-radicalization plan at a French Cabinet meeting on April 23. The strategy includes more than 20 measures—those not requiring new legislation will be implemented immediately—aimed not only at preventing French citizens from joining the war in Syria, but also at combatting the radicalization of young French Muslims at the earliest stages of indoctrination. This provision comes in response to several recent attempts by French teenagers to become jihadists in Syria. In one instance, a 14-year-old girl from the southeastern French city of Grenoble was intercepted with a one-way ticket to Istanbul at the airport in Lyon on February 25, just as she was about to board a plane. Police were alerted after the girl sent her father a text message saying she was running away from home because she had been selected to "join the jihad" in Syria. In another instance, two teenagers in Toulouse left for Syria on January 6, the first school day of 2014, after stealing credit cards from their parents to purchase plane tickets to Turkey. The youths—ages 15 and 16—were repatriated to France on January 26 and now face charges of conspiring with a terrorist enterprise. In all, at least 15 French teenagers have tried to travel to Syria since the war there began in March 2011, according to French intelligence. In most instances, the parents say they did not suspect their children were becoming radicalized. The Interior Ministry says it is urging parents to be more vigilant—especially about monitoring their children's activities online. The Ministry is also encouraging parents to contact the hotline at the first signs of radicalization. The names of radicalized youths will be placed in a database of wanted persons, a system that would prevent them from boarding flights to destinations beyond the borders of France. Cazeneuve also plans to pursue jihad recruiters online by means of a team of specialist investigators who will monitor jihadist chat forums and work undercover to infiltrate recruitment cells. Still another proposal involves making changes to French law that would enable police to confiscate the passports of suspected would-be jihadists, and to deport foreigners found to be recruiting jihadists in France, in addition to freezing their assets. "The emergence of a new generation of seasoned terrorists likely to strike on French territory demands a fixed, firm and effective response from the state. An entirely repressive response is not enough to stem the phenomenon. Preventive actions to counteract the 'preachers of hate' will also be implemented," Cazeneuve said while announcing the plan on April 23. One day earlier, Foreign Minister Laurent Fabius told RTL Radio that nearly 500 French citizens or residents are believed to have joined the fighting in Syria. "This is a very big subject," Fabius said. "Now more and more young people are going [to Syria] ... Our plan is to tackle this upstream [at the source] and all the way downstream. We will identify young people caught on this tragic path. We will monitor this online, and then we must stop them from crossing the Syrian border, and monitor their return and reintegration." The unveiling of the government's anti-radicalization strategy comes less than a month after French counter-terrorism police thwarted what they say was an imminent attack by a returning jihadist from Syria. Police say the man, identified only as a 23-year-old named Ibrahim B, was preparing to strike in the southern French region of Côte d'Azur. Some 900 kilos of explosives were found in the suspect's temporary apartment near Cannes. He is currently in police custody. Earlier in March, a militant Islamist website published a series of posters calling for attacks on France and for the assassination of President François Hollande in retaliation for the country's policies in Mali and the Central African Republic, the Reuters news agency reported. The al-Minbar Jihadi Media Network, a well-known Islamist website, created six posters as part of a campaign called, "We will not be silent, O France." According to Reuters, one of the posters reads: "To our lone-wolves in France, assassinate the president of disbelief and criminality, terrify his cursed government, and bomb them and scare them as a support to the vulnerable in the Central African Republic." 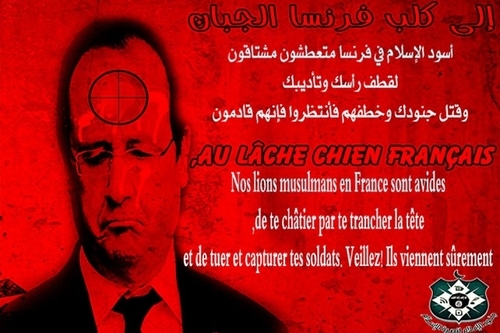 A poster from the al-Minbar Jihadi Media Network, threatening French President François Hollande. Amid the threats, critics of the French government are questioning the effectiveness of—and even the motive for—the new strategy. Some are saying that apart from the telephone counselling center, the plan offers nothing new. Others are wondering who will control the data collected by the new website and hotline, and how that information will be used, especially when it involves young people who have not been convicted of a crime. One counterterrorism expert interviewed by the newspaper Le Parisien says he believes the plan is aimed primarily at reassuring the public, "but in terms of effectiveness in the fight against terrorism, the effect is zero." Another expert told the newspaper that the plan would not prevent departures for Syria because those who are determined to do so can take a bus and thus evade airport controls. Moreover, even if parents or police confiscate passports of would-be jihadists, fake documents are easy to obtain. Still others believe the plan is a political ploy by Hollande aimed at blunting the rising popularity of the anti-immigration National Front party, which captured a record number of city council seats and mayorships in local elections held in March. National Front party leader Marine Le Pen told RTL Radio that the government's plan to fight against French jihadists will remain ineffective as long as border controls are not restored within the European Union. "The proposed plan is cosmetic," Le Pen said. "It does not attack the root of the problem, the speech in some mosques that are genuine calls to jihad. Nor does the plan attack recruiters and funding from foreign countries known to support terrorist fundamentalism, such as Qatar." Le Pen also said the government was being hypocritical. "France supported the Islamic fundamentalists in Libya, armed, supplied weapons and provided technical assistance to so-called Syrian rebels, while 80-90% of these rebels were actually related to Al-Qaeda. 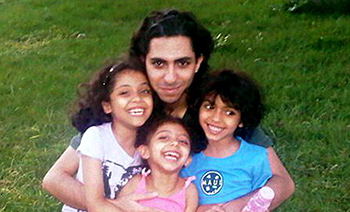 Why are we crying over spilled milk, asking, why are these young people doing jihad?" "It may be necessary to create a specific law on mercenaries, which exists in some countries," Le Pen added. Such a law would prohibit those who have French nationality to engage in fighting abroad either for financial or for ideological reasons. She also raised the possibility of "taking a very good initiative of [British Prime Minister] David Cameron and revoke French nationality from individuals convicted of participating in this type of fighting." Le Pen's charge of hypocrisy comes amid rumors that the French government paid $18 million to the Al-Qaeda offshoot Islamic State in Iraq and the Levant (ISIS) for the April 20 release of four French journalists held captive in Syria for more than 10 months. Citing NATO sources in Brussels, the German newsmagazine Focus reported on April 26 that the ransom money was brought to Ankara by French Defense Minister Jean-Yves Le Drian. French officials vigorously deny that any ransom was paid, but the French newspaper Le Parisien writes that "According to our information, the DGSE [French foreign intelligence service] negotiated directly with the rebel group. There can be no doubt that a payment was made." I believe the measures will be effective enough to slow down jihad tourism to Syria, but the fundamental problem remains unchanged: The rise of domestic Islamic terrorism from the immigrant Muslim population - a home-grown terrorism as opposed to the prior foreign-imported Al Qaida terrorism. This will be a massive game-changer in the public discourse on Islam(ization) because many Europeans will naturally feel this phenomenon is a betrayal of their hospitality. The French should invite an international coalition to deal with this menace. I believe this is just the beginning of the EU countries taking their own countries back and controlling their own borders just as they used to do, because they can see how dangerous these Jihadists are to their country and how easy it is for a kid to be taken in by all of the BS. The Mosques are something that need to be closed down just like they need to be closed down in the US. No one has any idea of how many terrorists there are in the US or how many go to the Mosques in the US to get their marching orders for their trips out of the country. It was the pervasive inclination to fight which allowed the earliest Moslems to conquer in short time all of the Middle East and North Africa. It's built into the faith, frozen in time. Therefore, young Moslems today don't need external influences to "get radicalised". It's not a transformative process. It's more like a "coming out" in front of an uncomprehending West. I'm using the word "terrorist" only because of its wide acceptance, while having reservations about its deceptive intent. Initially, the term was applied to tiny minorities like the two dozen members of the Baader Meinhof group in Germany. What we see today is clearly something different. In France is the Front National, the only partisan point of view that is the most serious about this invasion from Arab countries and Africa. If I were French I would vote for Marie Le Pen. Unfortunately in my country we haven't any political options like the Front National.